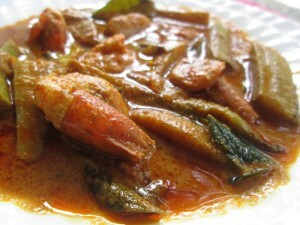 Chemeen Pachakaya Varutharacha Curry Recipe is a Kerala style fish curry which brings a homely and nostalgic feeling. Chemeen(prawns) is a favorite seafood of every one. Usually every housewives have their own way of preparing chemeen curry. Chemeen Curry can be prepared with chemeen alone or by adding any other vegetables with chemeen which will give a nice and splendid flavor to the dish. Here I am adding pachakkaya(raw plantain) with chemeen which adds a splendid taste. The shredded or grated coconut is slightly roasted with onions, coriander powder, turmeric powder, chilly powder and made into paste. The prawns and raw banana cooked in this mixture and kudampuli (gambooge) spreads a tempting aroma. I prefer to cook seafoods in manchatti(earthen vessel) which will enhance the taste. Try and Enjoy this Homely and Splendid Chemeen Pachakaya Varutharacha Curry. Clean and wash the prawns and keep aside. Peel and cut the raw plantain lengthwise into medium small pieces. Heat 2 tbsp coconut oil in a pan and roast the grated coconut until they turn into golden brown. Now add the chilly powder, coriander powder, turmeric powder and fry it for another one minute. Switch off the flame. When the mixture cools down, grind it into a fine paste. keep it aside. In a manchatti/earthen vessel or pan add the plantains, prawns, chopped ginger, green chilies, kudampuli, 3/4 cup water and enough salt. Cook it till quarter of the water in the pan is absorbed . Add the roasted coconut paste and 1/2 cup of water. Mix well and cook for 5 minutes. At last the curry should be tempered with chopped shallots and curry leaves. For this heat 2 tbsp of coconut oil in a pan and add the chopped shallots and curry leaves and fry it. Pour this over the curry. Tasty Chemeen Pachakaya Varutharacha Curry is ready.